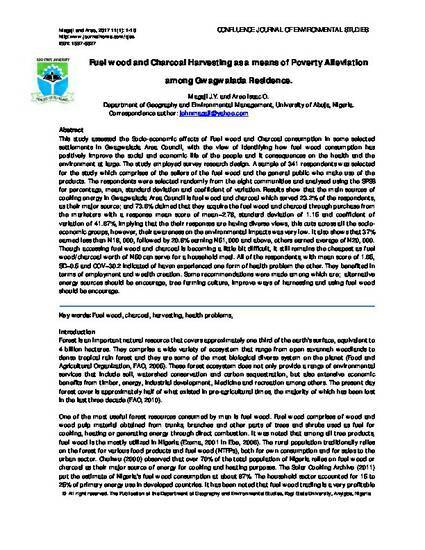 This study assessed the Socio-economic effects of Fuel wood and Charcoal consumption in some selected settlements in Gwagwalada Area Council, with the view of identifying how fuel wood consumption has positively improve the social and economic life of the people and it consequences on the health and the environment at large. The study employed survey research design. A sample of 341 respondents was selected for the study which comprises of the sellers of the fuel wood and the general public who make use of the products. The respondents were selected randomly from the eight communities and analysed using the SPSS for percentage, mean, standard deviation and coefficient of variation. Results show that the main sources of cooking energy in Gwagwalada Area Council is fuel wood and charcoal which served 23.2% of the respondents, as their major source; and 73.6% claimed that they acquire the fuel wood and charcoal through purchase from the marketers with a response mean score of mean=2.78, standard deviation of 1.15 and coefficient of variation of 41.67%, implying that the their responses are having diverse views, this cuts across all the socio-economic groups, however, their awareness on the environmental impacts was very low. It also shows that 37% earned less than N18, 000, followed by 20.8% earning N51, 000 and above, others earned average of N20, 000. Though accessing fuel wood and charcoal is becoming a little bit difficult, it still remains the cheapest as fuel wood/charcoal worth of N50 can serve for a household meal. All of the respondents, with mean score of 1.65, SD=0.5 and COV=30.2 indicated of haven experienced one form of health problem the other. They benefited in terms of employment and wealth creation. Some recommendations were made among which are; alternative energy sources should be encourage, tree farming culture, improve ways of harnessing and using fuel wood should be encourage.